octave violin, synthesizer, banjo, percussion, vocal on track 4 and 10. …and introducing Emory’s two sons…. Josh Lester - lead and rhythm guitar on tracks 2 and 5. Justin Lester - bass on tracks 2 and 5. Emory Lester’s passion for colorful music shines brightly in this, his finest work to date. 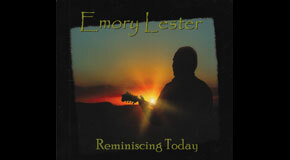 Complete with his most creative compositions, Emory’s strong, clear and lyrically inspired mandolin style sails through each track, which features songs of full acoustic instrumentation as well as solo mandolin, with two vocal performances by Emory of Graem Miles ‘Shepherd on the Hill’ and Al Stewart’s ‘Timeless Skies’. With noted past projects such as ‘Pale Rider’ and ‘Cruisin’ the 8’, this brand new release is sure to make it’s mark in the world of bluegrass, new acoustic, and mandolin featured collections, and continues Emory’s trail-blazing journey through the annals of mandolin artistry.